Place a small beef chuck roast in a pan. Add some onion, garlic & herbs. Fill to cover with water. Bring to a boil, lower heat to simmer and cook until fork tender (couple hours). Remove from pot. Fork shred once cool enough to handle. If you like, strain broth and use for another purpose. For the salsa, put any tomatoes, tomatillos, garlic and chile combination you like into a pot. Cover with water. Bring to a boil, then lower and simmer until tender (~10 mins.). Place all solids in blender. Season to taste w/ salt & cumin. Set aside. Heat a large skillet over medium-high heat. Add a pat of butter (or spray pan or use a dry pan). 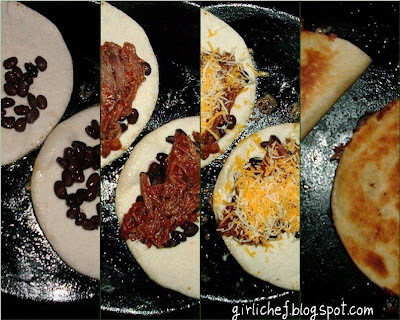 Place your tortillas on the skillet (how many depends on size of tortillas & skillet). To one half of a tortilla, add some cooked black beans. 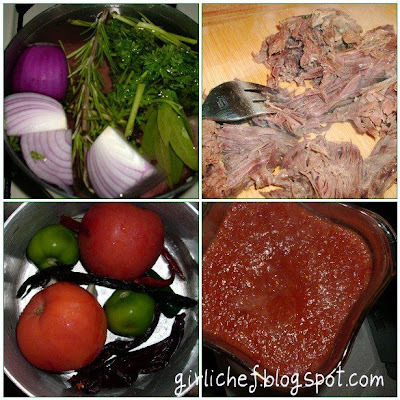 Stir together some of the salsa and the shredded beef, then add to the tortilla. Add shredded cheese. Flip other side onto fillings. Cook until golden on each side. Cut into wedges and serve with lettuce, sour cream & more salsa (or any of your favorite toppings/sides). Tuck in! 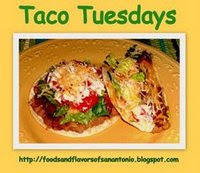 I'm also going to send this post over to Gloria to enter in the Taco Tuesdays at Tex-Mex Foodies! Thanks for hanging in there with me while I push through all of my transitions. DON'T FORGET TO ENTER MY GIVEAWAY! WIN SOME AWESOME SEA SALT & A PINCH BOWL TO PUT IT IN!!!!!!! Just see my sea salt post from April 1st (no fooling), follow the "rules" for the contest...and leave a comment after that post! Deadline for entry is April 4th at 11:59 P.M. eastern time (U.S.)....(that's tonight, by the way). Looks like a perfect weeknight meal..Very delicious.. good luck with the move, I hope all runs smooth!! Have a great weekend. These quesadillas sound like a delicious and quick meal. Good luck with moving! How is it you can pack to move, go back to work, and make a meal like that??? I think that you are SUPERWOMAN!! Good Luck with everything. Your quesadillas look really good! Thanks for entering them in Taco Tuesdays. :) Have fun with your move! I agree with Ginger; you're a superwoman! Darn those look good girli- I can taste them right now! Moving. We did that twice last year. Not fun. I hope it and your back-to-work transition go smoothly. Quesadillas are one of my favorite quick meals. Good luck with the move. The quesadillas look awesome. 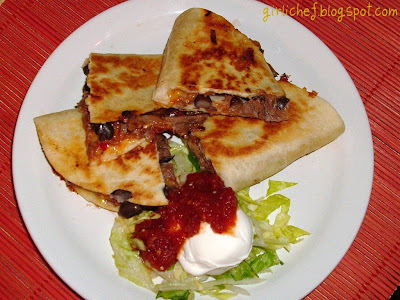 I don't know how you found time to cook these delicious quesadillas! You have so much going on. The best of luck with your new job! And hope moving goes fast and smooth. Guh... quesadillas. My tummy is rumbling now. You know... I've never made a quesadilla without one of those quesadilla grill things. Maybe I should get around to that soon... as I haven't had a quesadilla in over a year. Hey, good luck with the move and returning to work, those are both big changes! These quesadillas look AWESOME! yummm. i love quesadillas so much. these sound delicious! What a great weeknight meal. What a great weekend lunch! These really do sound delicious. That new kitchen will be wonderful. Stiff upper lip and all that till you're settled in your new home. Yum! When I have to move in July to the new apartment I hope someone will make me these quesadillas! They look delish! Good luck on going back to work and juggling it all! Love your quesedillas! Best of luck with two huge life changes!